This entry is way overdue! 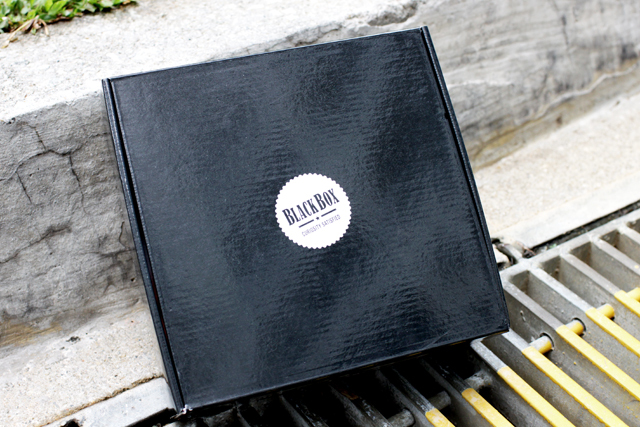 Not sure if you heard of Blackbox, the first free bi-monthly lifestyle sampling box in Singapore! I signed up for the first edition right away when I heard about it and was quite pleased with the box I received in February. 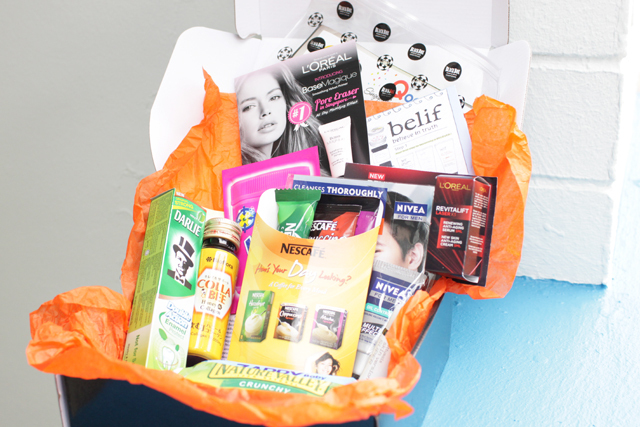 Then recently I got my second box at my doorstep in April, with more goodies! Yes, TOTALLY FREE. Check out the items inside my box. It was just so much fun going through them! 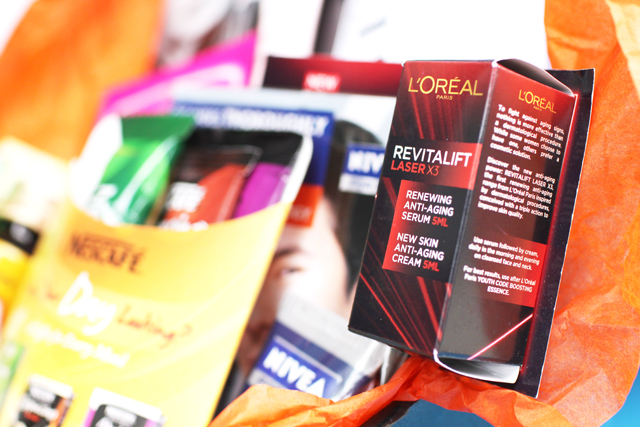 Heard so much about the Loreal Revitalift serum and cream, I am glad Blackbox gives me a chance to try the product first before I go and buy the full size one! One of my favorite things from the box are the vouchers!!! Both boxes I received in February and April had MANY vouchers with very attractive deals. 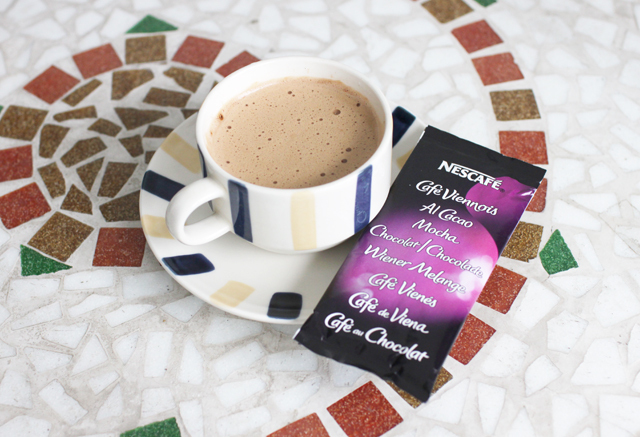 My whole family tried the Nescafe coffee packs! Good chance to try new stuff because we are low-risk and always buying the same brands, we hardly get to discover new good products! Definitely satisfied my curiosity over certain products! Hello people! So, I had five days off work from Thursday till yesterday and it was super shiok! If only I could be so free all the time. Haha. Was a productive and fruitful five days spent. Met Fiona and Ruoxuan on Thursday, went for movie and Ikea with the family and met Ben for Singapore Social Concert on Friday, met Ben again on Saturday for nothing, met Bf for movie and Ikea on Sunday, and met Ben and Isaac yesterday for dinner! (Crazy right, meet Ben so many times lol.) The rest of the time I spent it on watching videos and complaining about my slow computer which is about to crash anytime soon. This paragraph took me a longgggg time to type because it's just too laggy, the words on the screen can't catch up with my keyboard input speed! 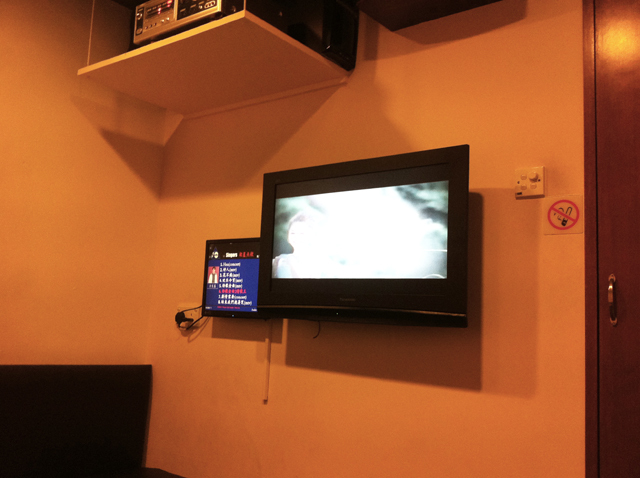 So on Thursday, I met Fiona earlier for KTV and it was a great session! The fried seaweed chicken was so yummy that I actually wanted to eat more than I wanted to sing. Haha. Ruoxuan came to meet up with us for dinner at Bedok85. Anyway, the renovations are finally done but I prefer the temporary site actually! The temporary site was brighter, neater, and had more empty seats! Anyway, I felt that the renovation was quite redundant. I felt that nothing much changed except that the number of seats actually went down! The unsheltered area which was previously foldable wooden tables and plastic stools are now replaced with cemented tables and chairs which takes more space and less people. 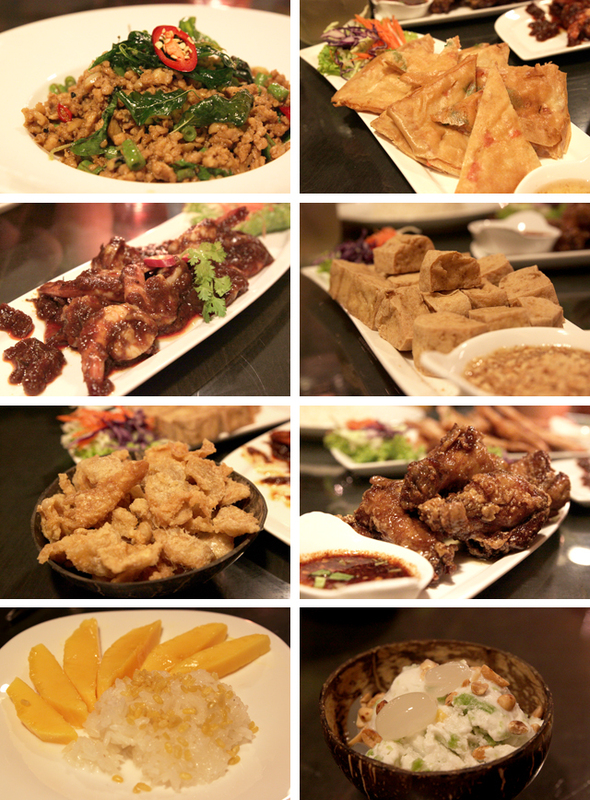 But still I simply love the food at Bedok85. I wish a hawker centre like that exists in my neighbourhood. I had sambal stingray, chaichee pork porridge add egg, bbq wings, oyster omelette. Wish I had space in my stomach for the sambal sotong and prawn too! Haha. Gonna try the Ba Chor Mee next time. 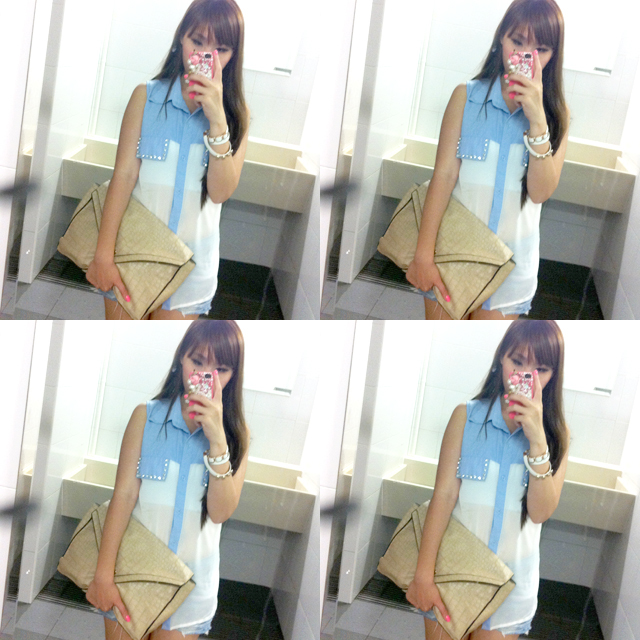 Wore top from Earthdoll (Bukit Panjang Mall #03-21). 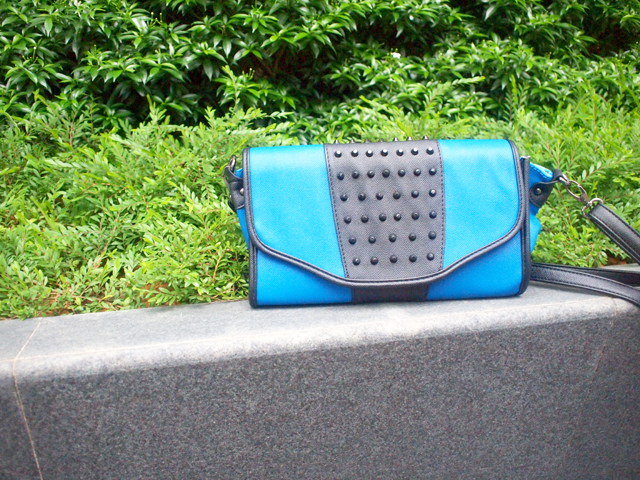 I love the demin + chiffon material and the shiny studs at the front! 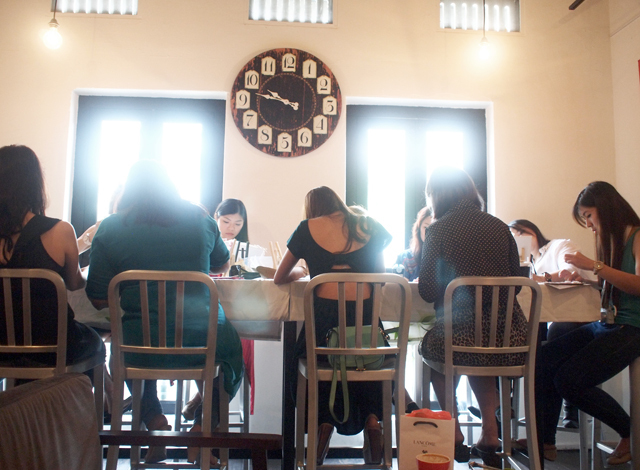 Of course, I will blog about the rest of the meetups next time! 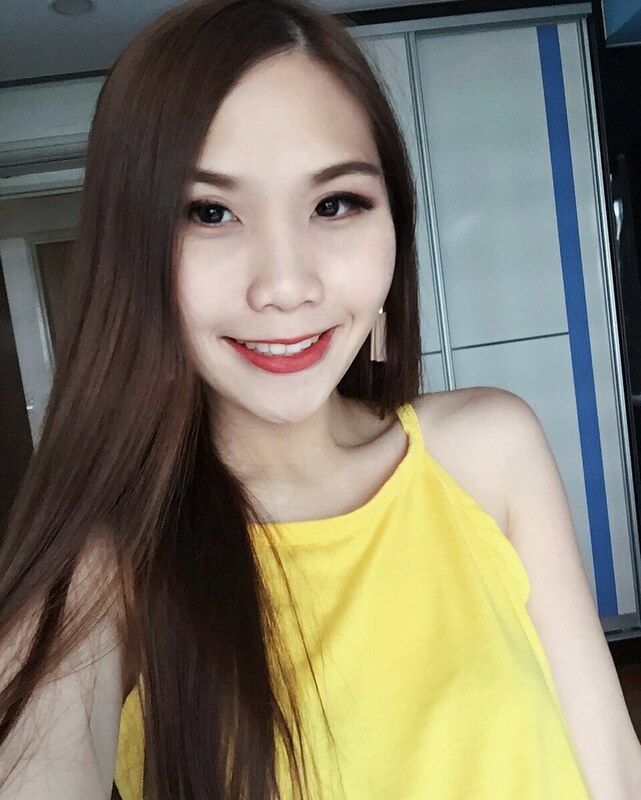 It was lucky that I had new clothes and accessories from Earthdoll (Bukit Panjang Mall #03-21), Lyraminn, Jipaban and Partandparcel to dress myself up for the five days of activities! 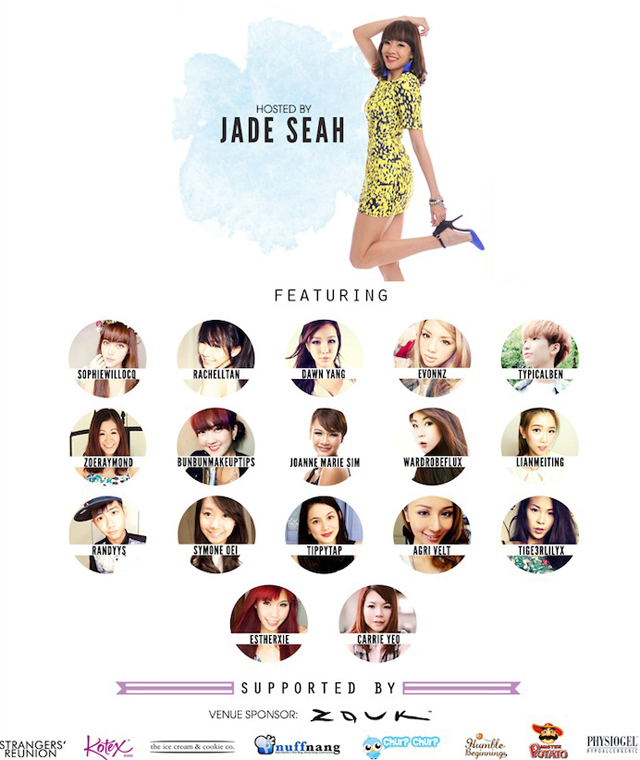 Speaking of Jipaban, they are holding a JIPABAN X BLOGGER BAZAAR on 2nd June!!! KEEP YOUR SUNDAY FREE OK! 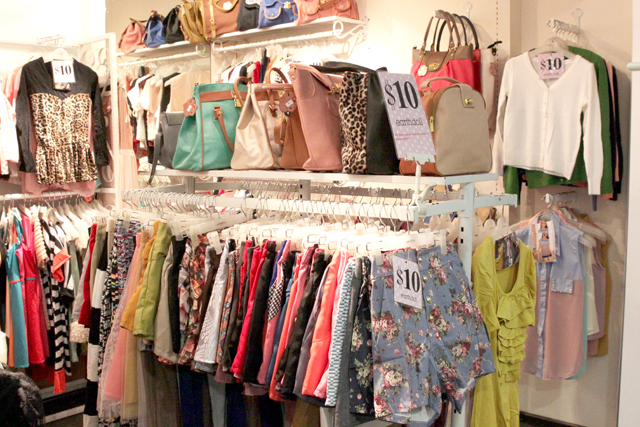 Me, along with other bloggers will be setting up a space to sell our stuffs! I'd be selling brand new/worn-once clothes at really low prices!! Might go as low as $2 - $5 for some of them. Please come and support us okay! Come early and be one of the first 1000 to get the goodie bags!!! 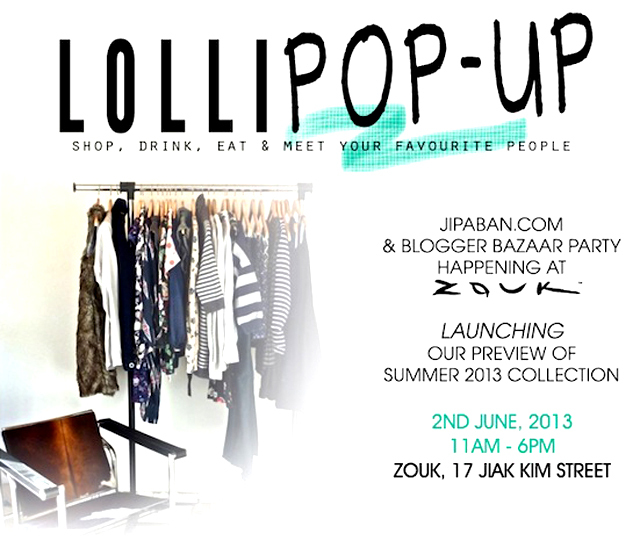 Besides us bloggers, there will be food and drinks and Jipaban will also be selling lots of items (menswear, womenswear, accessories, bags, shoes, games, stationary, DVDs and books). 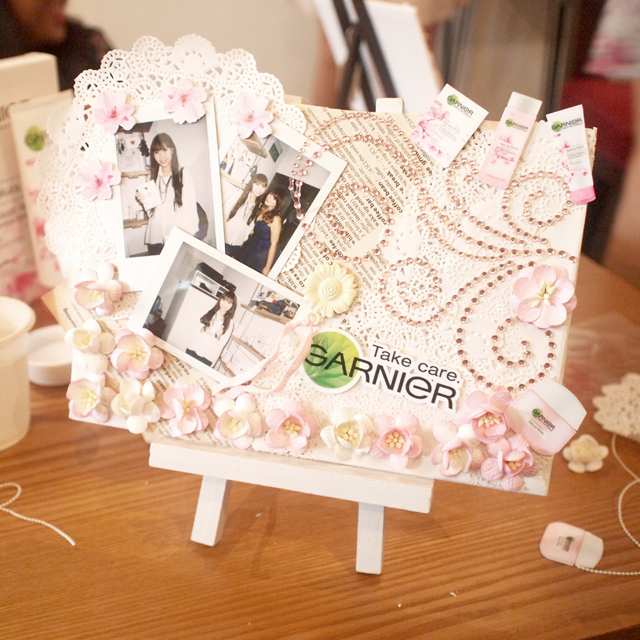 Check out more information on: http://www.jipaban.com/blog/2013/jipaban-x-blogger-bazaar/ and https://www.facebook.com/events/380783848706567! 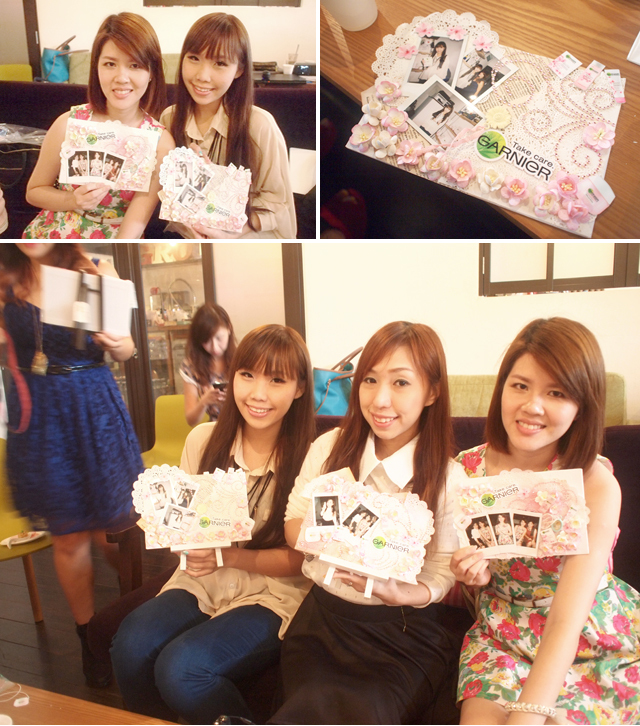 Attended the Garnier Sakura White Tea Party along with Nadia, Jacelyn, Fidelis and other beauty bloggers some time back! 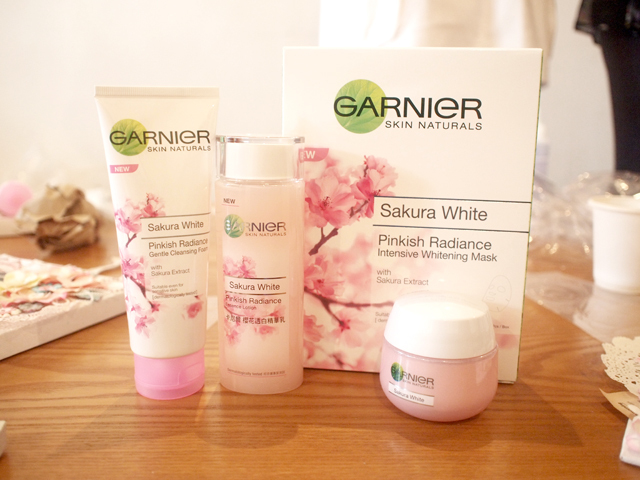 I was very interested to know more about the Sakura White range because I'm constantly on a lookout for whitening skincare products. There are basically four items in the range - Cleansing foam, Lotion, Moisturizing cream and Whitening mask. These four products claim to make our skin fair, transparent (highly hydrated), smooth, even, and rosy! That means less yellow, less brown and more pink! Basically, just pale white is not good enough. Bright skin + rosiness is the key! I haven't had time to start using the products yet, will do so soon! Here's my final piece! Everyone did our design differently but all was pretty! 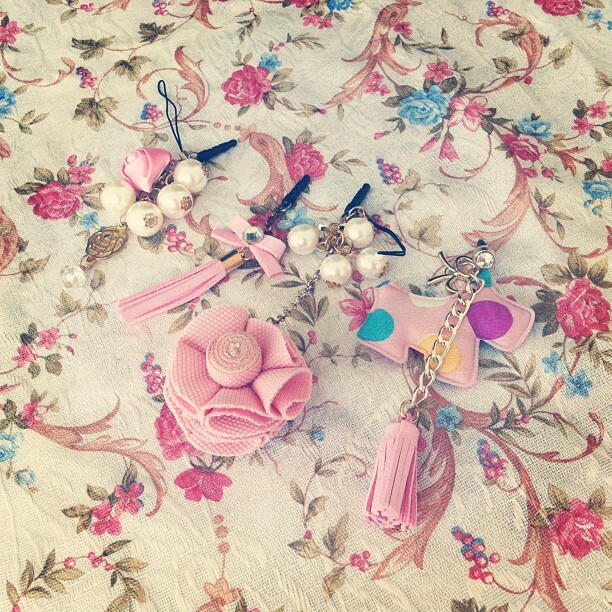 Well, nothing can go wrong with pink and florals right? Haha. Some photos with the girls! Of course, what is tea party without food? 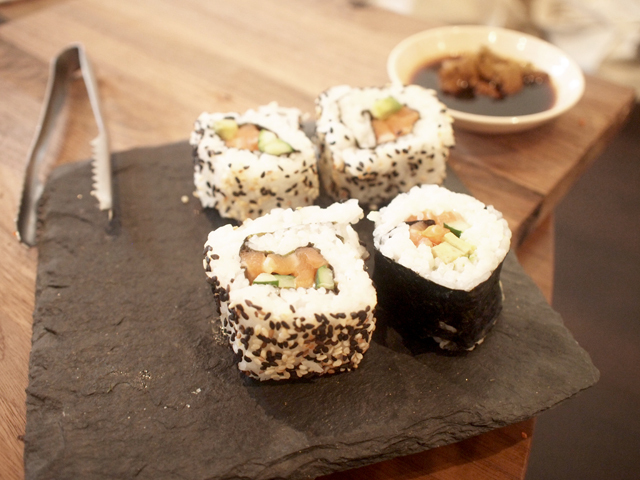 Although this photo I took is of the sushi, I actually want to say that the macarons were AWESOME~!! Okay, I'm signing off here. Bye! Everything I wore that day, except from the jeans, are from Jipaban! If you do not know yet, Jipaban is an online shopping mall selling everything from apparel to shoes to accessories to books to stationary to quirky gifts and more! There are always awesome promotions going on too! The bag! This looks really cool so the moment I saw it I knew I had to get it. 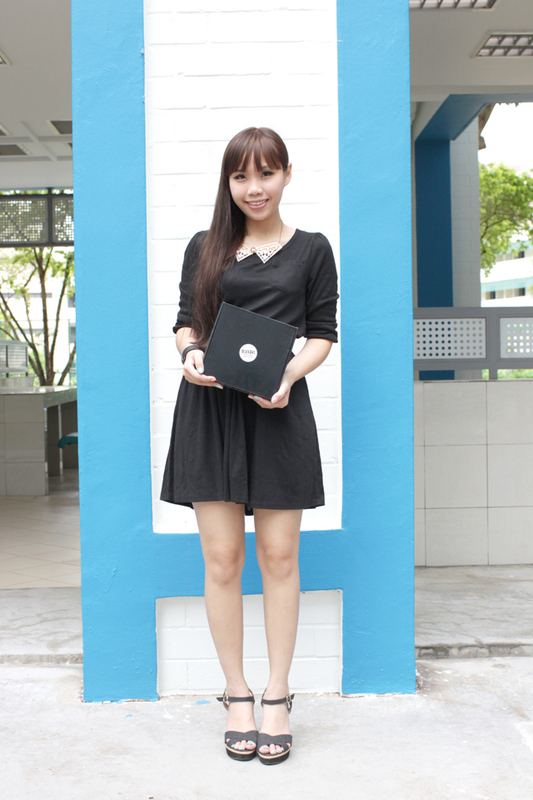 I am absolutely glad that I chose this pair of simple black heels. I think they are simple and easy to wear with almost anything. Suitable for work and formal occasions! For a period of time, I have been looking for pretty dust plugs while shopping but didn't buy any. Just recently, Bf got me these which he selected and bought from a random online store! Quite happy he bought all in pink! 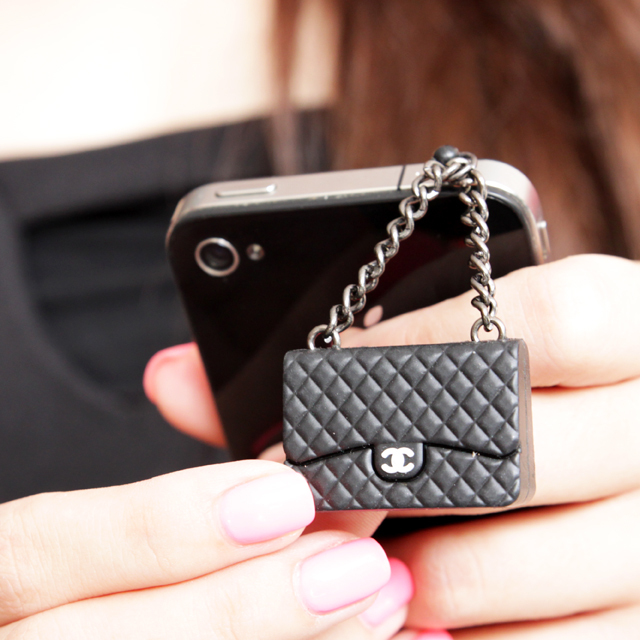 Speaking of dust plugs, I saw one in the form of a mini bag on Jacelyn's phone some time back and thought it was quite cute! Then a few days later, CovetedSG sent me this dust plug from their new arrivals!!! CovetedSG brought in many cute Chanel and LV bags dust plugs this time round! They are also have an ongoing giveaway where you can win FIVE dust plugs! 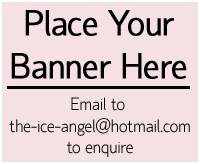 Like their facebook page to find out more! Contest ends 31 May 2013, so hurry! 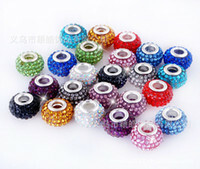 Dust Plugs in all different colors. The month of May is very vibrant with lots of events and activities! The most exciting one should be the one happening this week - Social Star Awards and Social Star Concert! I would like to thank Starcount and Nuffnang for the tickets to the show! Social Star Awards happens this Thursday, 23rd May 2013 and Social Star Concerts are on Friday - Saturday, 24th - 25th May 2013. The first concert features performances by popular stars like Carly Rae Jepson, Ceelo Green, Blush, and Psy! Aerosmith is the sole act for the second concert. 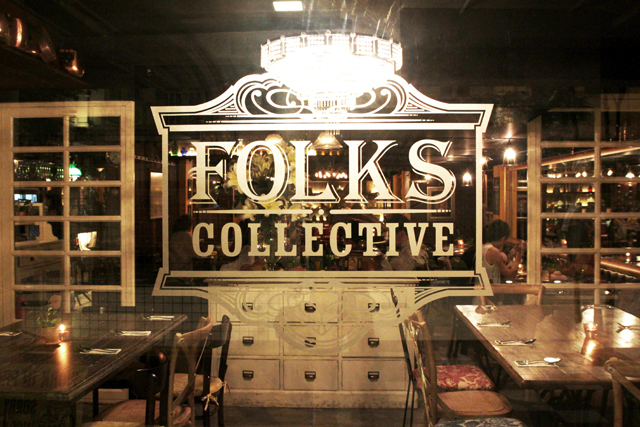 Bf recently brought me to this new restaurant "Folks Collective". He knew about this place after his friend posted some photos online and got him interested! It's really a lovely place! 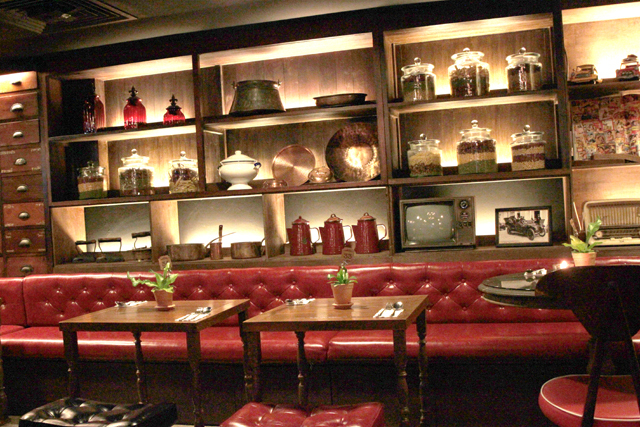 The decor has a lot of character and ambiance was nice with the dim lights. One thing, the service here is REALLY commendable. The staff were attentive, polite and sincere. It's very rare to see that in restaurants now! Most restaurants were at most not rude. The food was quite good! 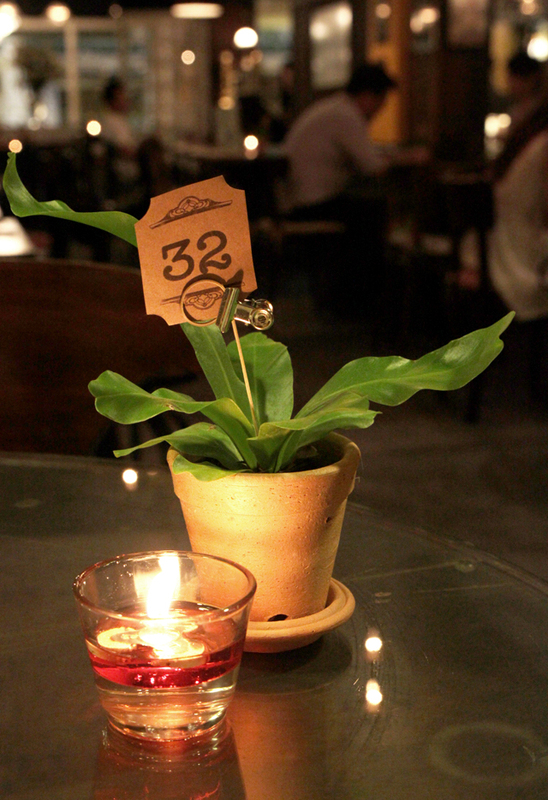 Love the basil minced meat, and sambal prawn! Crispy tofu was quite plain though... The prawn pancake was ok but not that good. The signature wings got sent to us but we sent it back to the kitchen as we didn't order that. Now that I think about it, we should have tried it instead! 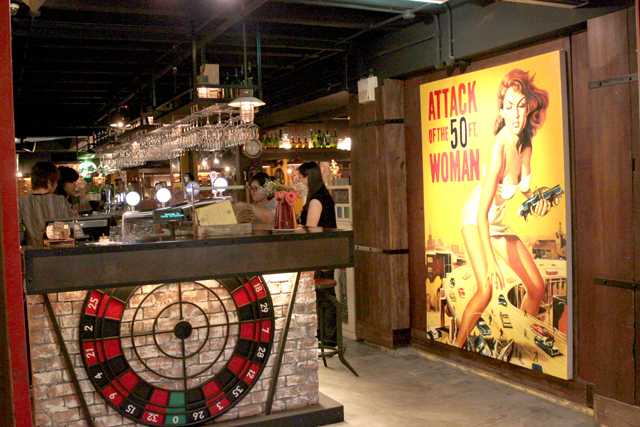 Monday to Saturday from 11am to 11pm. 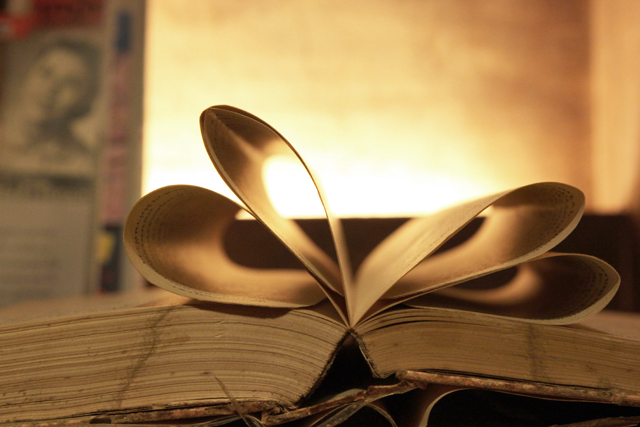 Yep, as the title suggests, I'm blogging about Today today. Bf brought me and my sister to Korean BBQ buffet lunch at some ulu place today. Sadly, the food was a total disappointment for all of us. 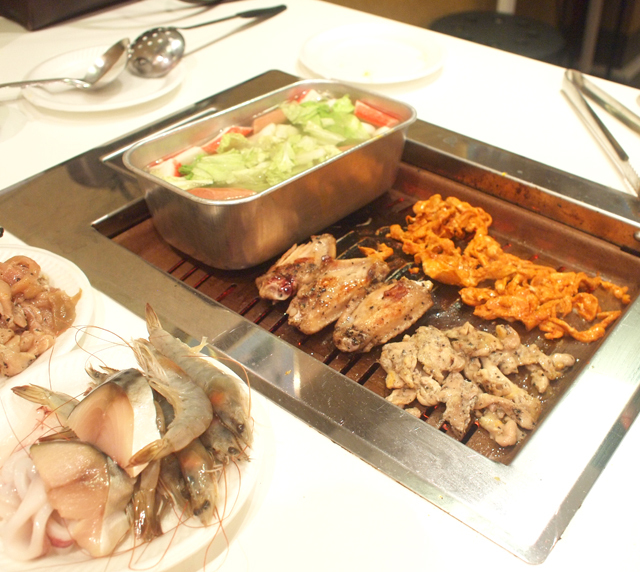 The selections were quite limited and the taste was nothing close to the other Korean BBQ I had before. The plates were disposable styrofoam and it 'melted' a few times after I put hot food on it. The soup was tasteless. When I commented that it was tasteless, bf said "no lah" but after that I saw him pour some soy sauce in. Didn't expose him but he will know that I know when he reads this. Hahaha. And, the tasteless soup in the "pot" was not boiling at all. My sister calls it "the soup that never boils". Haha. I didn't dare to eat anything from it after biting into a hard, raw piece of fishball that has been cooking since the start of the meal. Soup bowls from the counter was mostly dirty as well (lucky I checked before drinking from it!). Towards the end of the meal, we tested the soup by cracking an egg inside. It was the slowest-cooking egg I have ever witnessed. You know how egg whites usually form within seconds inside boiling water? It didn't happen until quite some time later. Of course, nobody ate that egg. The price wasn't cheap too. For the amount we paid, we could have ate much better food. 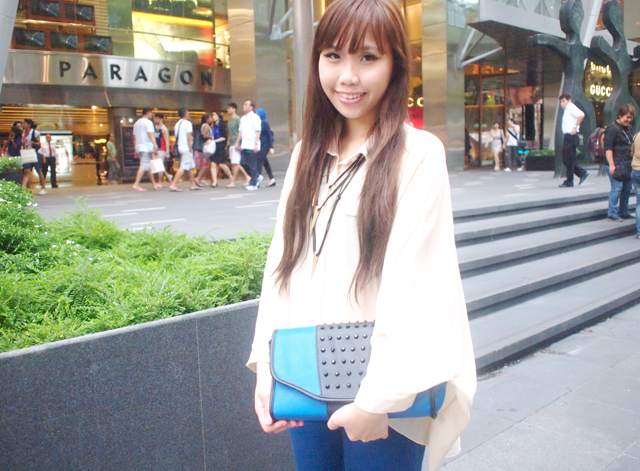 Went over to Nex afterwards to walk around. 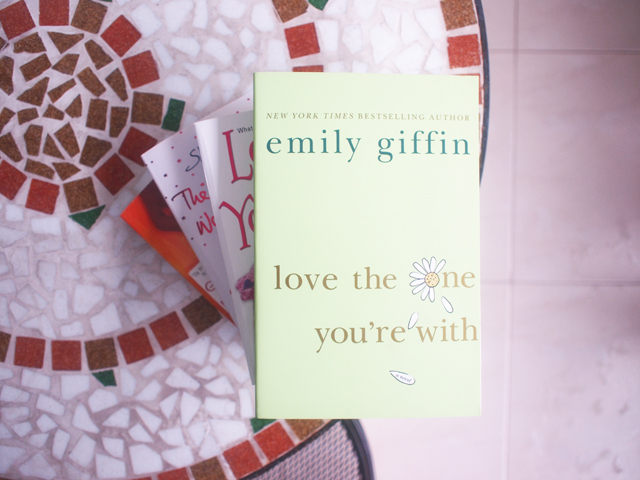 Got myself new books because they were only $3.60 - $7.10 after card discount!! Outfit of the day with sis! 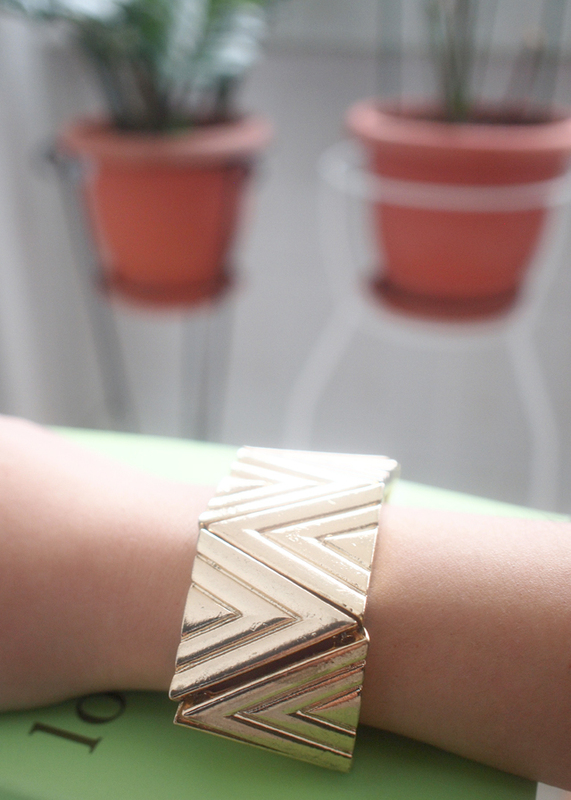 Wore accessories from www.jipaban.com to add something to the otherwise casual outfit! 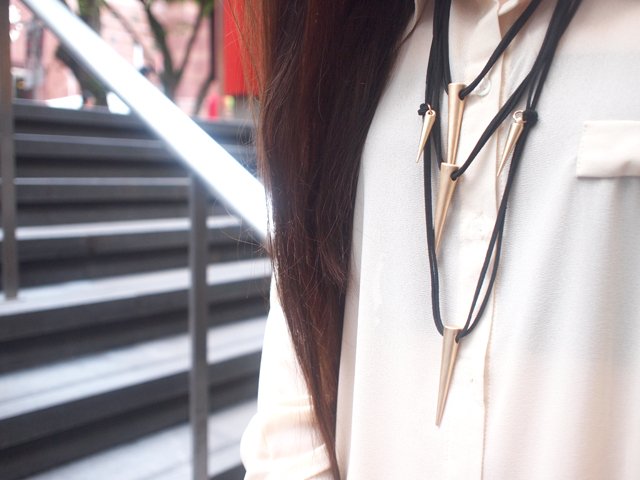 Super love the necklace! The design quite unique! Head over to www.jipaban.com if you like it too! New gelish nail color done at Millys! Simple but bright! ^_^ Feel very happy whenever I look at my nails now! Anyway I forgot to bring my phone out today! It resulted with me being more talkative than usual, until bf cannot tahan and my sis kept laughing at us. Haha. Okay, shall end this entry here. Bye~! How did you celebrated Mother's Day with your Mum this year? On the day itself, Dad and Sis were away at work so me and Bf brought her out for dimsum lunch at Marriott Hotel! Before I go into that, let me tell you all what happened the night before! My family usually goes to bed slightly pass midnight. Before 12AM, I crept into her room and placed our gifts inside her wardrobe. 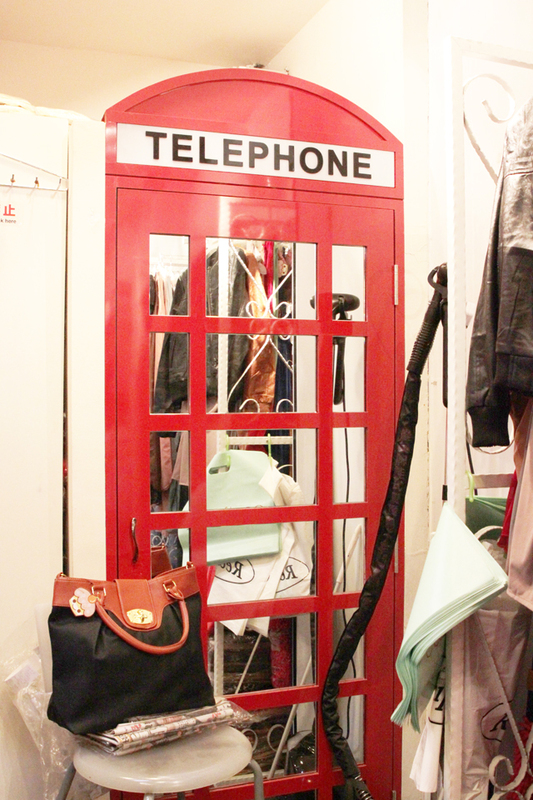 We were hoping that before she goes to bed, she would open her wardrobe and tada~~ surprise! Our plan didn't went exactly as planned. When it was time for bed, she went directly to her bed, attention fixated on a Candy Crush game on her phone. We continued to chat some random nonsense with her in the room, so that we can see her reaction when she eventually opens the wardrobe door! Usually we don't do that, so she should suspect something right? But the usually clever mum, did not even notice the strangeness.... Hahaha. While mum wasn't looking, dad went to open her wardrobe door secretly. Then he said... "eh, you never close your door ah". Hahahahaha. Didn't know Dad's acting so good. BUT, mum's eyes didn't leave her phone screen for even a second. She just said "close lor." Haha. At this point, me and sis were already trying not to burst into laughter! Then, we really couldn't wait any longer. I said... "妈咪，你睡觉前没有开橱的meh?"... Hahaha. She looked at us for a moment and then finally realize what was happening and happily went to retrieve the presents from her wardrobe. Haha. We got her a bag and some beauty items! Hope she likes the gifts! So as I mentioned at the start of the entry, we went to have dimsum. Here's my outfit breakdown for the day! Wedges from www.jipaban.com... I have the green version earlier and loved it so much I got the exact same design in blue this time. I specially got the feather earrings to match the color of the wedges. I am feeling quite happy because my calendar is filling up with awesome meetups and events! ^_^ So excited about dressing up and catching up with my friends! More activities means more new clothes needed! 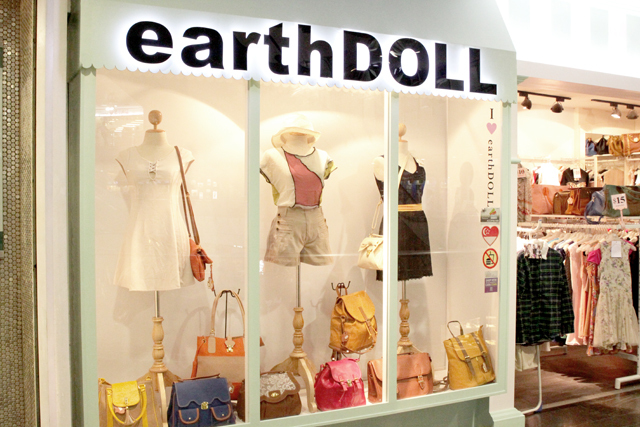 It's a good thing I just shopped at EARTHDOLL (Bukit Panjang #03-21) awhile back! Remember my entry on them previously? I visited them again after their recent renovation. Check out the cute fixtures! 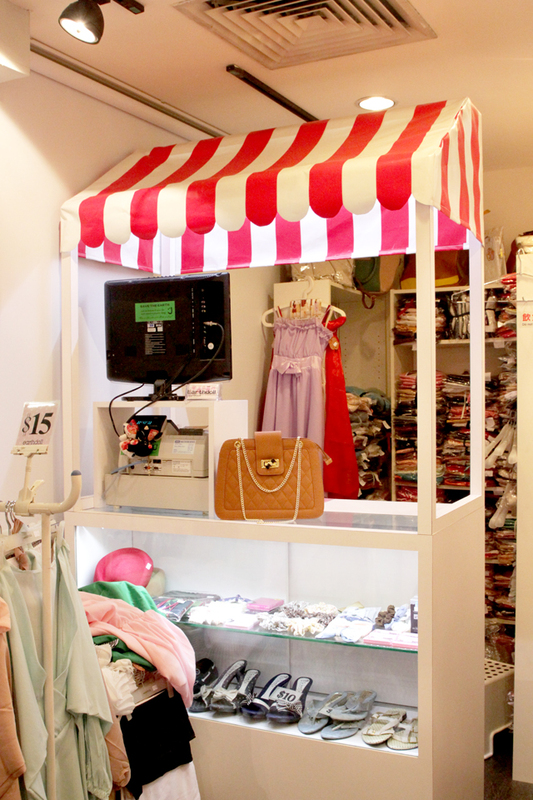 Although the shop is prettier now, prices remain extremely affordable! Most of the items are still $10-$15! I spent a long time in the shop going through every single piece. There were SO MANY varieties to choose from! Among the styles are sweet, feminine, edgy, trendy, floral, casual and office wear. Here are some of the pieces I tried on. 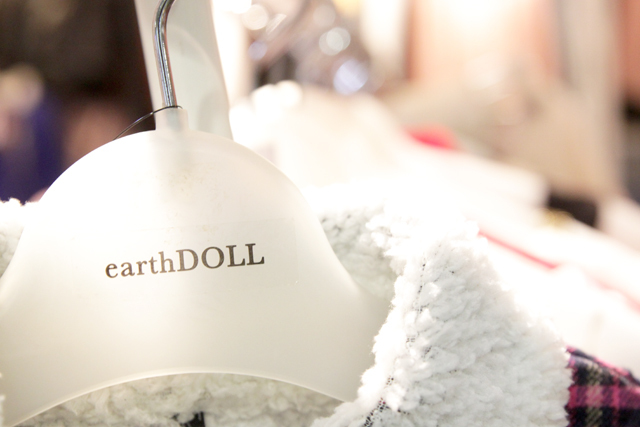 EARTHDOLL has received many positive feedbacks from customers about the affordability, variety, designs and service! 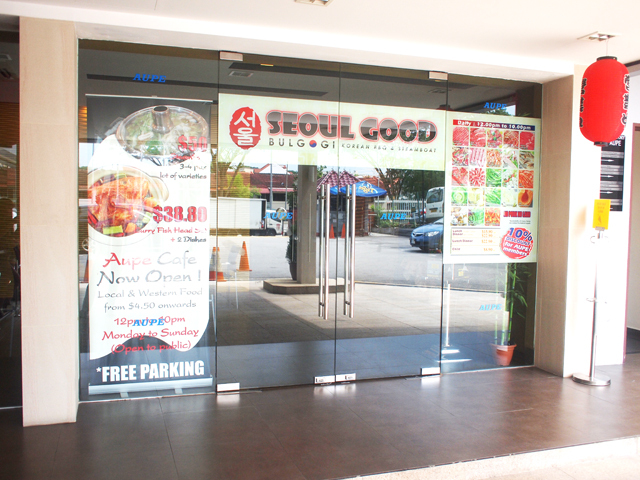 The staff that served me was extremely friendly! Dress in this photo also from the shop!